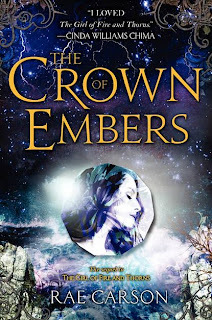 Elisa might be considered a heroic queen by her new kingdom, but she's learning that holding on to her power and asserting her authority is going to be as hard as defeating the Inviernos. She can't figure out who is loyal to her and who might be behind the latest attempt on her life; all she knows is that she can trust Hector, and she must find a way to gain control of Joya D'Arena and help her country recover. When it seems like answers might be found across the sea to a site of ancient power, Elisa bravely makes the journey...but even she can't imagine the great rewards and great costs. The Crown of Embers, the sequel to The Girl of Fire and Thorns, is just as as rich, lovely, and layered as the first book. Carson continues to skillfully build upon and expand Elisa's world, exploring the landscape of her world, delving deeper into the religion and magic, and introducing new tidbits of history about Elisa's people and the Inviernos. In between all of the political intrigue and danger is Elisa's struggle to define what sort of leader she is. She must learn who to trust among those around her, and how to trust in her own knowledge, faith, and intuition. This personal growth is beautiful to read about, and not without its hiccups and bumps in the road. But Elisa's friends and Hector are there to support her, and the developing romance between the queen and her guard is smoldering. Carson deftly writes scenes that are tender and romantic, all the while conveying a sense of urgency that defines the tension of Elisa and Hector's relationship perfectly. She's an incredibly dynamic writer--sensual and intense, playful and intense, all of these scenes flow fluidly together to create a breathtaking sequel that will raise the stakes and have readers desperate for more. Cover Comments: I love this pretty cover--the gem and the lightning are so powerful. I was surprised by how much I enjoyed the first book and I'm really looking forward to checking out this sequel-hope it can meet my expectations!